As I’ve mentioned many times before, one of my favorite flavors/ingredients is almond. These Toasted Almond Lemon Bars from The Sweet Melissa Baking Book by Melissa Murphy sounded irresistible. They have ground toasted almonds in the crust and almond extract in the lemon filling. This was a tasty twist on the classic lemon bar and a perfect spring treat. 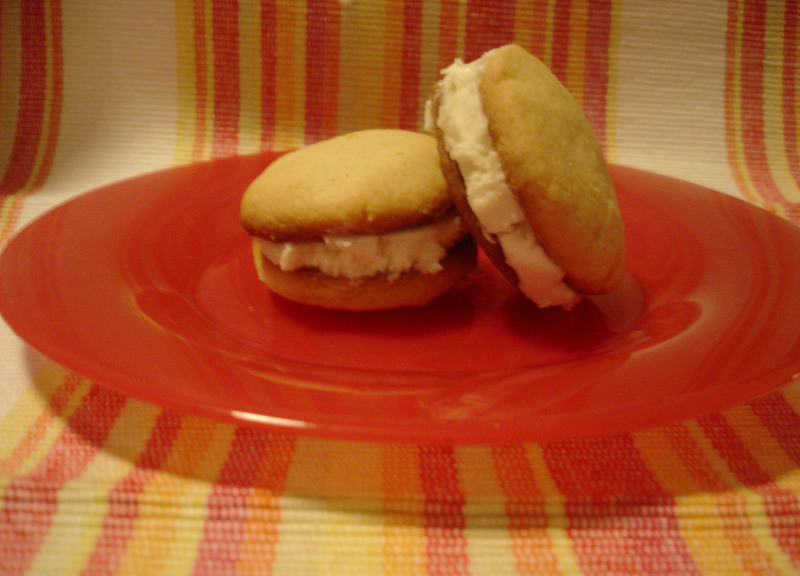 This recipe was selected by Holly of Phenomenon as April’s Cookie Carnival selection. I continue my recent trend of being late to the party, by posting way past the deadline. But, better late than never, right? Spread the almonds in a single layer on a cookie sheet. Bake for 10 to 12 minutes, or until lightly golden and you can smell them. Remove to a wire rack to cool. Position a rack in the center of your oven. Preheat the oven to 350 degrees F. Spray a 9 x 13 – inch pan with nonstick vegetable cooking spray. Make a parchment “sling” by cutting two pieces of parchment paper, measuring 16 1/2 inches long by 12 inches wide (you can also use aluminum foil). Place one piece across the length, and the other across the width of the pan, with the excess hanging over the edges. You will use this sling later to lift the finished bar from the pan. Spray the sling with the cooking spray. 1. In the bowl of a food processor fitted with the metal blade, pulse the flour, sugar, almonds, and salt to combine. Add the cold butter in pieces and pulse until the dough comes together in a ball. 2. Turn the dough out into the prepared pan and press evenly into the bottom and 1 1/4 inches up the sides. (This crust, once it is baked, needs to act as a liner in which to pour the liquidy lemon filling. So be sure to do a good job of pressing the dough up the sides – no cracks!). Cover the dough with a piece of parchment paper or aluminum foil, and fill with pie weights ( you can use dried beans or uncooked rice as pie weights as well). Bake for 25 to 30 minutes, or until lightly golden. Carefully remove the pie weights and the liner and bake for an additional 10 to 15 minutes, or until the whole crust is golden. Remove to a wire rack to cool. In a medium bowl, whisk together the eggs and sugar until smooth. Add the almond extract and flour, and whisk until smooth. Add the lemon juice, and whisk to combine. 1. Pour the lemon filling into the prepared crust. Reduce the oven temperature to 325 degrees F. Bake for 30 minutes, or until the filling is firm and lightly golden. Remove to a wire rack to cool. 2. When cool use the parchment sling to lift the entire bar from the pan and onto a cutting board. Slice into twelve 3 x 3 1/2 – inch bars. Remove from the pan and, using a small sifter, dust with the confectioners’ sugar. The bars keep in an airtight container at room temperature for up to 2 days. For longer storage, wrap in plastic wrap and refrigerate for up to 5 days, or freeze well wrapped in plastic wrap and then aluminum foil for up to 3 weeks. Do not unwrap before defrosting. Dust with confectioners’ sugar before serving. I am a few week’s late to the party but I did make the Inside-out carrot cake cookies (or as someone in my house called them “carrot cake whoopie pies”) last week. These were relatively easy to make and jammed pack with good stuff like golden raisins, walnuts, and of course, carrots. The batter/dough was delicious. The cookies had much more of a cake texture than a cookie texture. I found that they spread more than I expected them to, so next time I make them I will definitely make them smaller to have more petite cookie sandwiches. My husband loved the honey-sweetened cream cheese filling. Kate made a lovely PDF of the recipe that you can find here. For this month’s Cookie Carnival we were given two options for cookies: chocolate roll out cookies or vanilla/sugar roll out cookies. I opted for the chocolate ones since I had recently made sugar cookies. It struck fear in my heart when Kate also announced that there will be a cookie decorating portion to this month’s cookie pageant. I can bake, sure…but, my cookie decorating skills are very, very, very lackluster. They look about the same as a 5 year old could do. I made several different shapes: trees, stars, hearts, houses, and little men. I thought I had more holiday cookie cutters than that but there wasn’t a candy cane or snowflake cookie cutter in sight… And I had grand deluded plans of pretty little snowflake cookies. Color me disappointed. Despite my sub-par decorating skills, I loved the way these cookies tasted and loved their texture. My little cousins (who range in age from 1-4) were impressed with the cookies and were begging their moms for some before we even had Christmas dinner. Glad to know my decorating skills have some fans. Sift first 5 ingredients and cinnamon, if desired, into medium bowl. Stir chocolate in metal bowl set over saucepan of simmering water until melted and smooth. Set aside. Using electric mixer, beat butter in large bowl at medium speed until smooth and creamy, about 2 minutes. Add sugar and beat until mixture is pale and fluffy, about 2 minutes. Add egg; beat until well blended, about 1 minute. Reduce speed to low and beat in vanilla and chocolate. Add flour mixture and beat on low speed just to blend. Gather dough into ball; divide in half. Form each half into ball and flatten into disk. Wrap disks separately in plastic and chill until firm, at least 4 hours. DO AHEAD: Can be made 2 days ahead. Keep chilled. Let stand at room temperature 30 minutes before rolling out. Position rack in center of oven; preheat to 350°F. Line 2 baking sheets with parchment paper. Working with 1 disk at a time, roll out dough between 2 sheets of waxed paper to 1/8-inch thickness for smaller (2-inch) cookies and 1/4-inch thickness for larger (3- to 4-inch) cookies. Using waxed paper prevents you from adding too much flour, which will make the cookies tough. Using decorative cookie cutters, cut out cookies. Cold dough is much easier to work with. If it gets warm as you’re cutting out the cookies, place the dough—waxed paper and all—in the freezer for about 5 minutes. Use an offset spatula to peel away the excess dough and transfer the cookies to parchment-lined baking sheets, spacing 1 inch apart. Gather scraps, roll out dough, and cut more cookies, repeating until all dough is used. If not icing cookies, decorate with sprinkles or other sugar toppings, if desired. Bake 1 sheet at a time until cookies are firm on top and slightly darker around edges, about 9 minutes for smaller cookies and up to 12 minutes for larger cookies. Line baking sheets with fresh parchment as needed. Cool completely on rack. Decorate cookies with royal icing if desired. DO AHEAD: Cookies can be made 4 days ahead. Store between sheets of waxed paper in airtight containers. Chocolate chip cookies must be one of the most baked recipes out there. 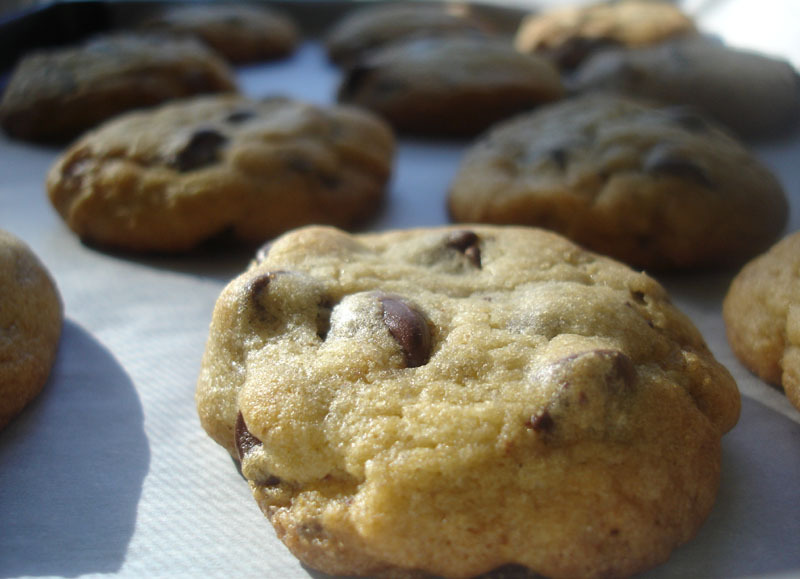 At any bake sale or potluck you will usually see at least a couple of plates of chocolate chip cookies. I had proof of this just a couple of weeks ago, when 2 out of 15 guests at my book swap brought chocolate chip cookies. Our fabulous Cookie Carnival hostess, Kate, selected a chocolate chunk cookie for this month’s cookie. The Ultimate Chewy and Soft Chocolate Chunk Cookies recipe comes from the cook book In the Sweet Kitchen: The Definitive Baker’s Companion by Regan Daley. I do not own this cook book, but based upon this cookie recipe and the very positive reviews on Amazon, I will most likely pick it up at some point in the future. I used half bittersweet chocolate and half semi-sweet chocolate. 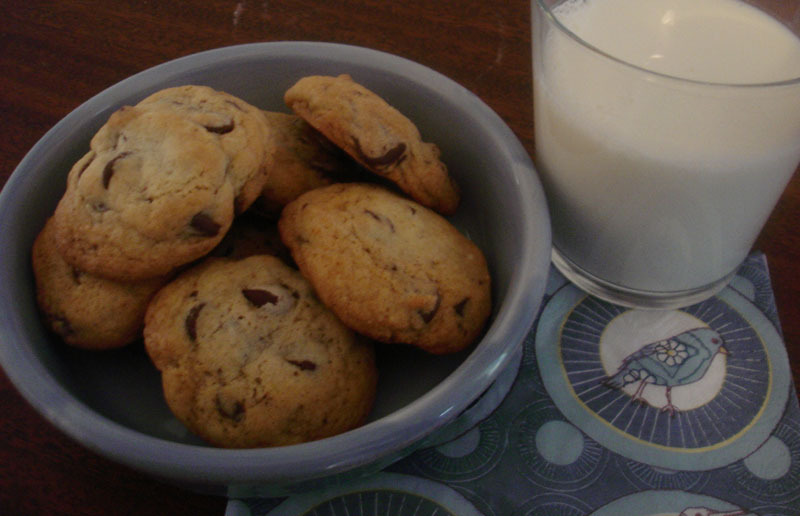 The cookies were soft and chewy as advertised and were great straight out of the oven with a glass of milk. They were quickly gobbled up by all who came into contact with them. This may just be my new go-to chocolate chip/chunk cookie recipe! 1. Preheat oven to 350 F. Line two baking sheets with parchment paper, or lightly butter them, and set aside. In the bowl of an electric mixer, or stand mixer fitted with paddle attachment, or a large bowl if mixing by hand, cream the butter and sugars until light and fluffy. Add the eggs, one at a time, beating well and scraping down the sides of the bowl after each addition. Beat in the vanilla. 2. Sift the flour, baking soda and salt together in a small bowl. Add the dry ingredients to the butter-sugar mixture, and mix until just combined. Fold in the chocolate chunks. 3. Using your hands, shape knobs of dough about the size of a large walnut and place them 2 inches apart on the baking sheets. Stagger the rows of cookies to ensure even baking. Bake 12-15 for smaller cookies, 14-17 for larger ones or until the tops are a light golden brown. If the cookies are neither firm nor dark when they are removed from the oven, they will cool chewy and soft. Cool the cookies on the sheets for 5 minutes, then transfer to wire racks to cool completely. If somehow they don’t get inhaled immediately, they may be stored airtight at room temperature for up to one week. Okay, so I totally ignored the “mini” part of this recipe. I wasn’t in the mood for mini. I wanted a nice full-bodied whoopie pie that I could stuff my face with. After all, it is starting to get quite chilly out and I need to start adding a nice layer of fat to protect myself from the cold. That’s a fat layer on top of the one that is already there. 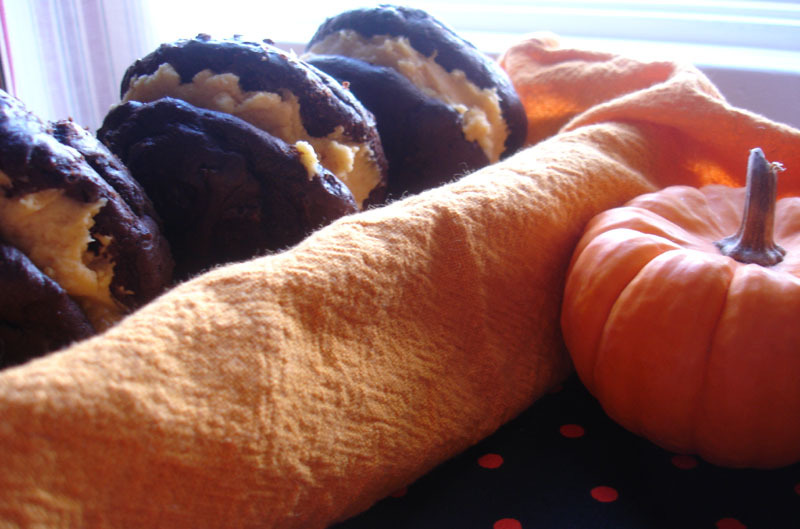 When I first read the title of this recipe I assumed that the cake part of the whoopie pie would be the pumpkin part… nope, I was wrong… these pumpkin whoopie pies have the traditional small devil food cakes but instead of a vanilla cream, they have a spiced pumpkin cream sandwiched between them. 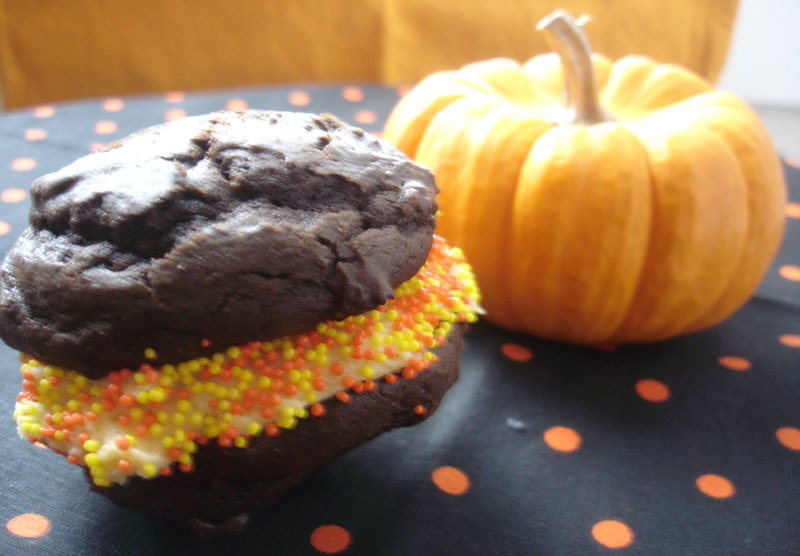 The whoopie pies were easy to make. With my generously sized dollops of batter I ended up with a total of 10 assembled whoopie pies. My husband thought that they weren’t quite sweet enough. I was intrigued by the filling but thought that it could have used more oomph. 1. Prepare cookies: Preheat oven to 375 degrees. Sift together flour, cocoa powder, baking soda, and salt into a medium bowl; set aside. 2. Place butter, shortening, and sugars into the bowl of an electric mixer fitted with the paddle attachment. Mix on high speed until smooth, about 3 minutes. Add egg; mix until pale and fluffy, about 2 minutes. Mix in half the flour mixture, then the milk and vanilla. Mix in remaining flour mixture. 3. Drop about 2 teaspoons dough onto baking sheets lined with parchment paper, spacing 2 inches apart. Bake until cookies spring back when lightly touched, 12 to 14 minutes. Transfer baking sheets to wire racks and let cool 10 minutes. Remove cookies from baking sheets and transfer to wire racks using a spatula; let cool completely. 4. Prepare filling: In the bowl of a mixer fitted with the paddle attachment, whip together cream cheese, butter and confectioners’ sugar on medium speed until smooth, about 3 minutes. Add pumpkin, cinnamon, and nutmeg; whip until smooth, scraping down the bowl as necessary. 5. Pipe or spoon about 2 teaspoons filling on the flat sides of half the cookies. Sandwich with remaining cookies, keeping the flat sides down. September was my first time participating in Cookie Carnival. Cookie Carnival is a monthly event where a bunch of people make the same cookie recipe and share their results and experiences. For September, the cookie selection was Grapefruit Sandwich Cookies and was suggested by Mari. The recipe is from Martha Stewart’s website. 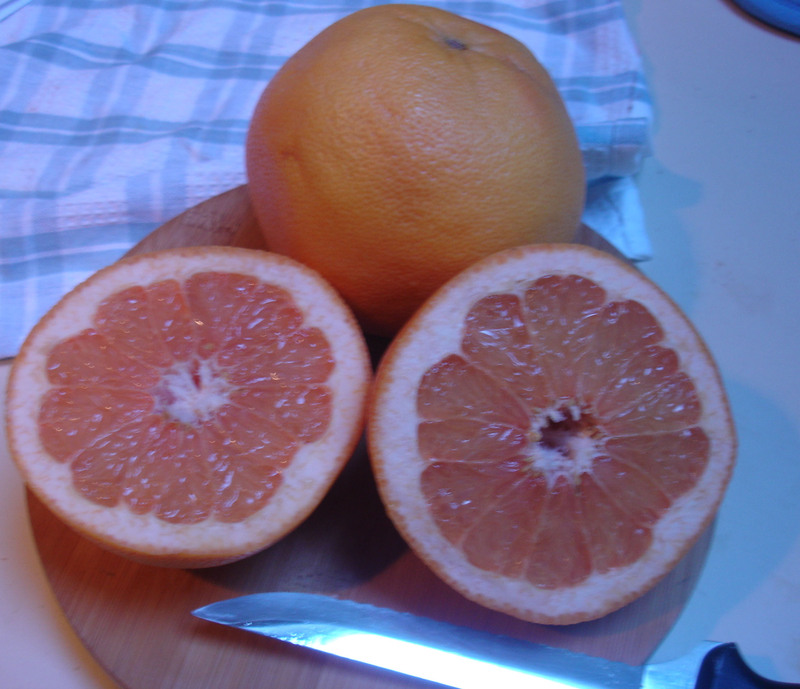 I have never been a die-hard grapefruit fan. Some of my friends in college tried to make me curb my cursing habit by making me take a drink of grapefruit juice everytime I swore. Sadly, taking a sip of grapefruit juice only made me swear more. 😉 Since then I have learned to appreciate the taste of grapefruit more. I don’t mind it mixed in with other juices, but wouldn’t be likely to drink it on its own. With this recipe, I figured the evilness of grapefruit would be squelched by the goodness of cookie. And I was right! I found the filling too soft to work with immediately so I refrigerated it for 30 minutes or so before assembling the sandwich cookies. And here’s the finished product… My cookies were a little thicker than Martha’s so mine ended up looking like miniature whoopee pies. 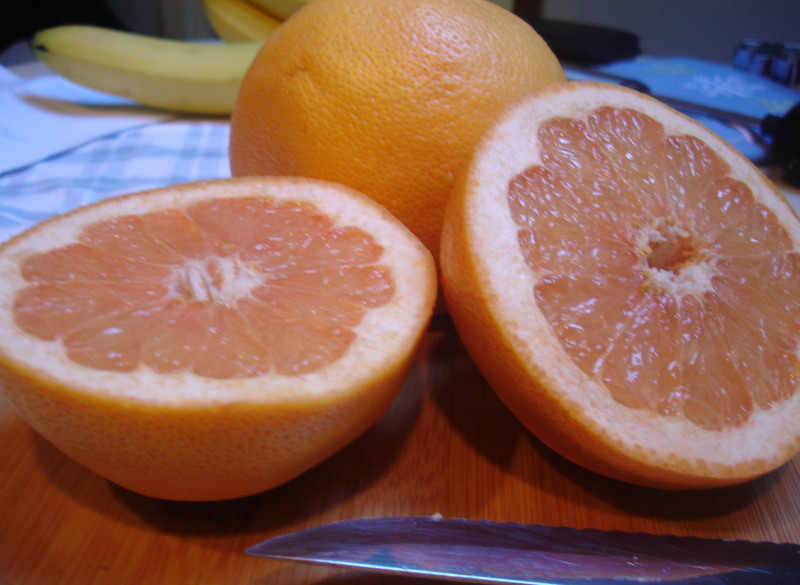 The taste was good and the sugar balanced the sourness of the grapefruit resulting in a cookie with a delicate grapefruit/citrus flavor. No puckery faces here! You can bake the cookies and make the filling a day ahead. 1. Preheat oven to 350 degrees. Line a baking sheet with parchment paper; set aside. In a small bowl, combine zest with 1 tablespoon sugar; set aside. In a medium bowl, whisk together both flours, baking powder, and salt; set aside. 2. In the bowl of an electric mixer fitted with the paddle attachment, beat butter and remaining sugar on medium-high speed until light and fluffy, about 2 minutes, scraping down sides of bowl as needed. Add egg yolks, and beat until combined, scraping down sides of bowl as needed. Beat in reserved zest-sugar mixture. Add flour mixture in two batches, alternating with the juice, and beat to combine. 3. Turn out dough onto a piece of plastic wrap, and shape into a 1-inch-thick disk. Wrap in plastic, and refrigerate until firm, about 30 minutes. 4. On a lightly floured work surface, roll out disk to 1/8 inch thick using a lightly floured rolling pin. Using a lightly floured 2-inch round cookie cutter, cut out rounds and place about 1 inch apart on prepared sheet. Bake, rotating sheet halfway through, until edges are golden, 18 to 20 minutes. Transfer sheet to a wire rack to cool 5 minutes. Transfer parchment paper and cookies to rack to cool completely. 5. 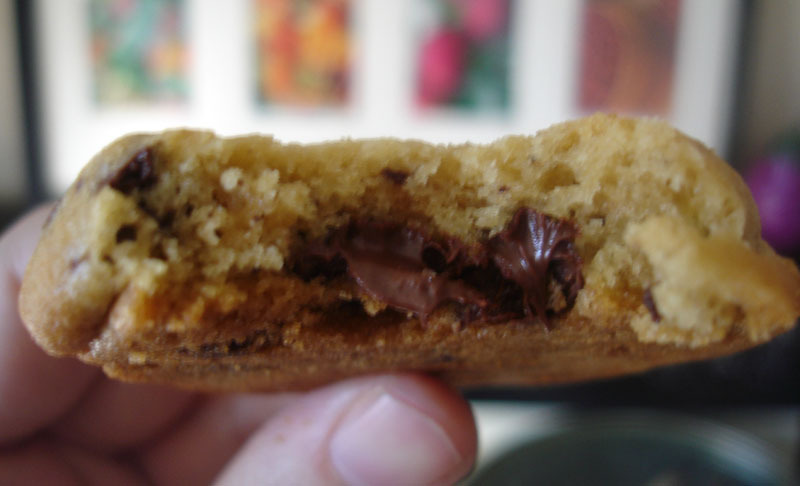 Using an offset spatula, spread 1 tablespoon filling onto flat sides of half the cookies. Sandwich with remaining cookies, keeping flat sides down. 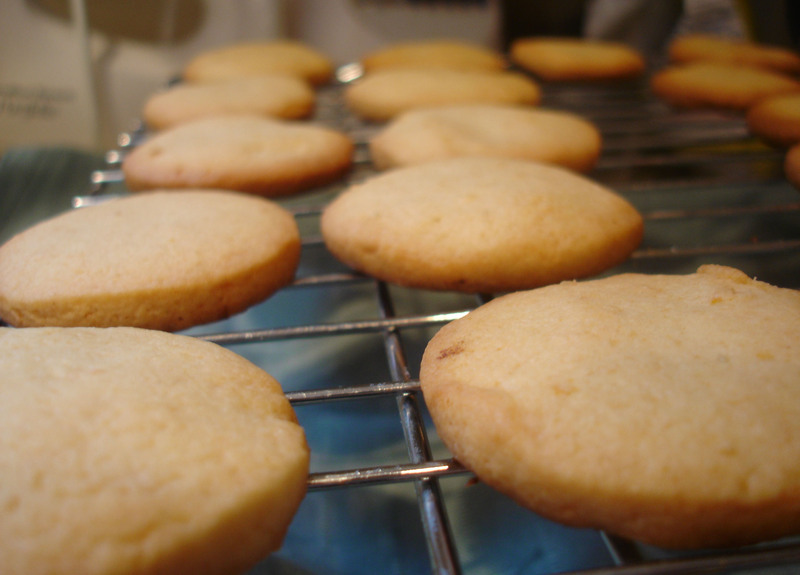 Once filled, cookies can be kept in an airtight container in the refrigerator for up to 3 days. Makes enough to fill 15 sandwich cookies. 1. In the bowl of an electric mixer fitted with the paddle attachment, beat butter and sugar until light and fluffy, about 4 minutes. Beat in honey. Add juice, 1 tablespoon at a time, until filling holds together and is smooth and creamy, about 2 minutes. Transfer to a small bowl, cover, and set aside until ready to use.